This was a quick and easy make – Jalie 3248. I bought the pattern probably a year ago already and left it lying around because I didn’t have the perfect reversible fabric in my stash to inspire me to sew it up. 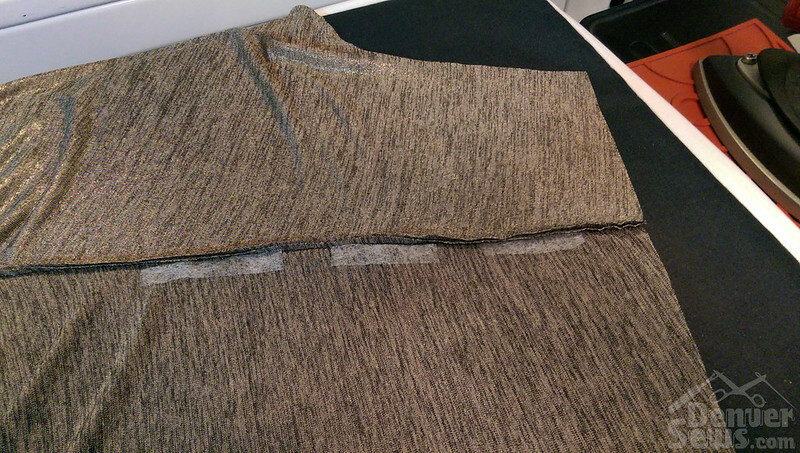 A couple weeks ago I was at JoAnn’s (just to get zippers… you know how that goes) and picked up this neat fabric. It’s a gold and black variegated knit that has some kind of gold lame finish applied to one side. (I *think* this is the fabric – it was part of the Gilded Age collection still in stores.) When I saw it I thought of my Jalie pattern instantly. Well, I’m kind of a dope because when I got the pattern out I realized that the front is two pieces and you don’t really need a reversible fabric! But it’s nice to have two sides to use that are automatically coordinated. By the way, you can buy Jalie patterns on the Jalie website from Canada or Fabric.com has a limited selection with free shipping in the United States. They’re a great company for knitwear patterns (especially now that Kwik Sew got bought out and isn’t making many knit patterns). The fun feature of this pattern is clearly the lapels-turned-pockets which are formed by folding over the front piece and joining it with the side seam. Like here in the shoulder seam! The pattern instructions are similar to when you do an enclosed seam on a yoke using the burrito method. It’s a little confusing if you’ve never done it before, but it looks great because there are no raw edges showing. The order of construction is great for this pattern – it utilizes the double front to hide a lot of the seam allowances so that basically only the sides and sleeve seams are exposed. Don’t worry if I’m confusing you, Jalie has diagrams in their instructions. The back neck is finished with a binding… not very exciting, sorry. The pattern went together easy and fits well. I shortened the sleeves by 3″ and the body by 2″ along the lengthen/shorten lines – something I always have to do because I’m only 5’2″. I have to say, I really appreciated the drafting on this pattern. There are 27 (!) sizes included because all Jalie patterns come with a size range starting at girls sizes and going all the way up to plus size. But they clearly adjust with different slopers at different points in the size range because the fit is great on the plus size end. 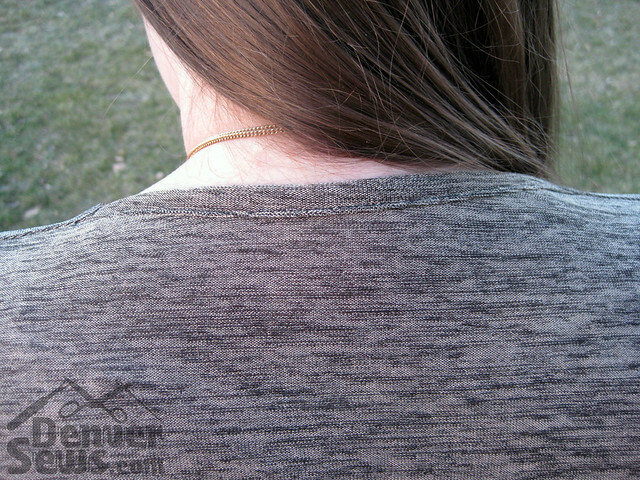 For example, a lot of companies draft sleeve side seams as straight lines from the armpit to the wrist. But as you put on weight, it tends to be mostly above the elbow… think of a turkey leg shape. And this Jalie pattern has a bend in the sleeve seam at the elbow that matches this shape. I was also happy with the shoulder fit which is something a lot of companies tend to draft too big on plus sizes. Oh, and if you’re local, Marnie is putting together a group Jalie order at the DSC meetup Thursday to get the 25% promo going on. Come with the numbers of the patterns you want… hint hint. Next The Vintage Sewing Challenge! Love it. Want it. Need it. Wow Jamie, you look so pretty! 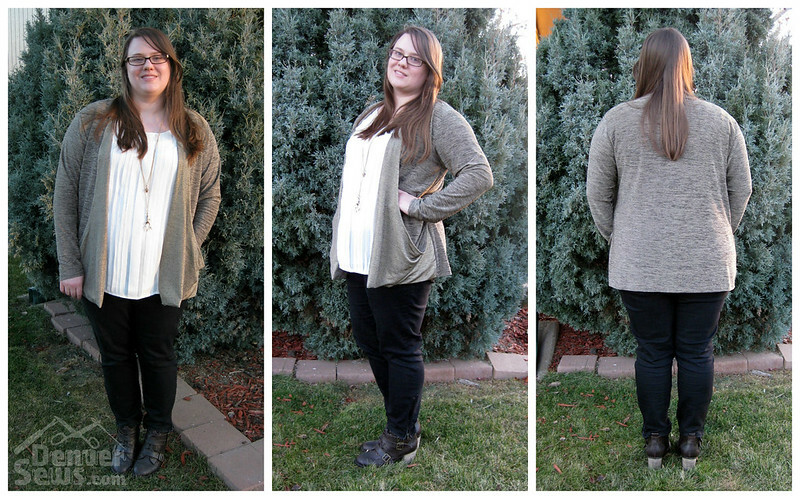 The cardigan is awesome in the fabric you chose and your smile shows how happy you are with the outcome. I absolutely love it! Nice looking! Great pattern and fabric use. Jamie, this is so cute. Thanks for showing it. How’s the Pati Palmer thing going? I can hardly wait to see the class. 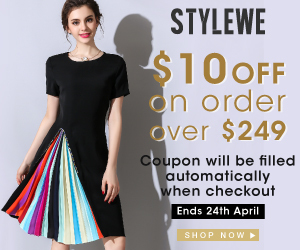 Looks fabulous on you! Nice job. Very nice! What a great choice of fabrics for this sweater. I love Jalie patterns, but this is one of the few I don’t have. it’s a great fit for you, Jamie.